I'm feeling a little under the weather. My throat hurts when I swallow as do my ears...ugh. So, I'm going to focus on fun things. Jelly Belly scented nail polish! Saw this on the shelf of a local drugstore. Who knew?! PBGVs are extroverted, friendly, and independent hounds. 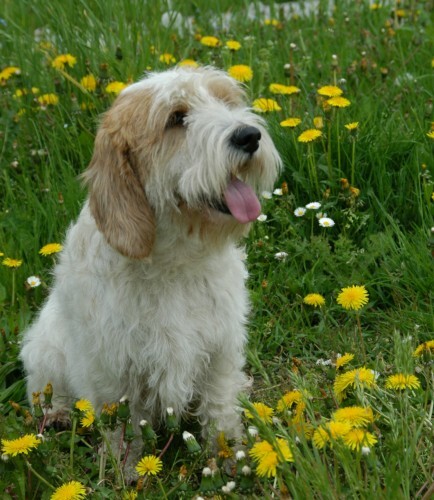 Sometimes called the "happy breed," PBGVs have tirelessly wagging tails and expressive, intelligent eyes. PBGVs are typically active and lively. The PBGV standard states that the dog should "give voice freely" -- as is typical of hounds, petits are outspoken dogs. If their 'pack' begins howling or singing, the dog will join in, with amusing results. PBGVs may howl alone or with a companion; they may howl to music, for fun, or in protest at being left alone. PBGV companions report that sleeping dogs have been known to awaken and howl along with favorite songs. Because they are so extroverted, friendly, and happy, PBGVs make excellent therapy dogs. Do you know what else makes me happy? Food. Specifally, good food with friends. Friends of ours invited hubby and me over for Toblerone fondue last week! another friend and me this past weekend at my favourite all day breakfast spot! Food always makes things better. A howling dog? I think not. Laura, sorry you're under the weather. It stinks to feel sick. I hope you're 100% again very soon. The Jelly Bean nail polish must be cute. I haven't seen it before. I'll have to look for it. It would make a great gift, paired with a bag of jelly beans for a little girl. Hang in there. Spring is just around the corner and then we'll all feel better!